Unique features are scatted throughout the Smoky Mountains, from deep valleys with quick rivers to steep summits with rocky slopes. Trails that explore this Appalachian diversity will stick in your memory and keep you searching for new favorite spots. With a steadily inclining segment of the infamous AT bringing you most all the way to one of the most unique viewpoints in the entire Smoky Mountain National Park, the Jump Off is well worth the walk. The Jump Off is a notable 1,000-foot cliff face on the side of Mount Kephart. Once you see it, you’ll easily understand the name, as it produces magnificent views of Charlie’s Bunion and Mount Guyot from atop a very steep precipice. 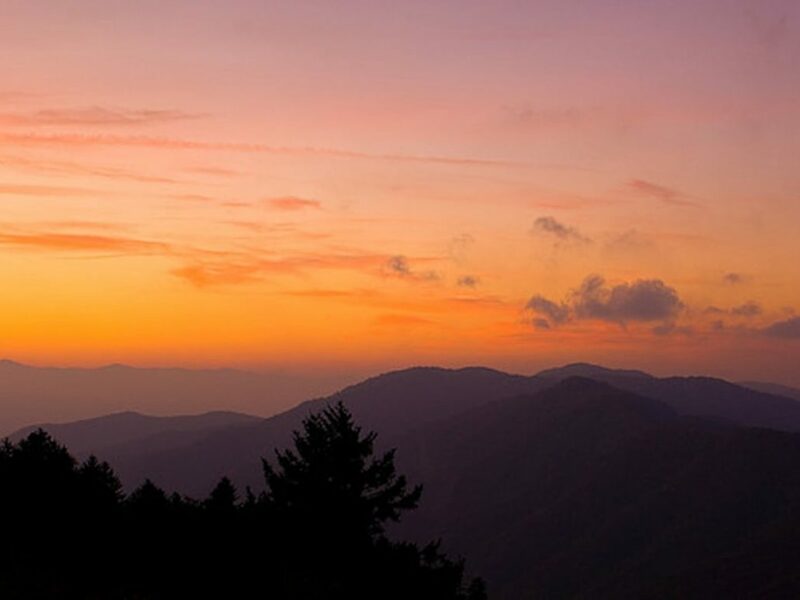 To get to this impressive landmark, one great option is to take the Appalachian Trail from Newfound Gap and connect it with the Boulevard Trail. It’s a 6.5 mile out and back trail with quite a bit of climbing, but it’s generally pretty steady grade, so don’t be too worried. About 2.7 miles in, after you’ve conquered most of the elevation gain, you’ll reach the trail junction for the Boulevard Trail. Take a left here, and not before long, you’ll encounter the Jump Off junction, from where you’ll only have about half a mile left until your final destination. This trail provides great hiking in all seasons. Diversity keeps things interesting on any trail, and this one does not disappoint. From the trailhead at Newfound Gap the path to the Jump Off steadily winds and ascends along the AT, giving breathtaking ridgeline views of the Smoky Mountain Highlands. Several large clearings along the way allow photo-ops for hikers that give a unique view of the surrounding forest. From these clearings, the destruction of the Hemlock Woolly Adelgid can be seen on neighboring mountains. The towering trees lining the trail often are surrounded with thick mosses and ferns, giving hikers the feel of wandering through a rainforest. During the winter months, the trail is often coved with ice like melted candle wax. During these colder months, the trail is more difficult but the added aesthetic of the ice makes an unreal experience. Hikers, this trail is all yours. Trail runners will also enjoy the upward journey to this iconic mountain feature, but hikers will have the most enjoyable time. Because this is a section of the famed AT, many long-distance hikers will be passed along the way. This trek may even inspire you to do a long trip of your own. Parking for the Jump Off is found at the Newfound Gap lot. The trailhead can be found at the edge of the parking lot, where the AT will be followed for 2.7 miles to the Boulevard Trail intersection. Once a left is taken onto the Boulevard Trail, the Jump Off trail will be on your left after about 0.5 miles. All of these trails are well marked. Any backcountry camping requires a permit, and dogs are not allowed on the trail.